A porcelain veneer is a thin porcelain facing that covers the front of your tooth, changing its size, shape or color. If you have been unhappy with the appearance of your smile, porcelain veneers could be the answer you’ve been looking for. Dr. Bartlett is an experienced cosmetic dentist with extensive training in the aesthetic aspects of dentistry. 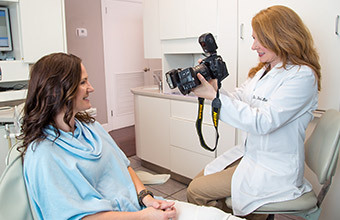 Making smiles look better is a central part of her approach to dentistry, and she puts great care into improving the appearance of her patients’ smiles. She has perfected her planning and preparation for veneers over the years, so that she is able to obtain beautiful, natural-looking results. For the best quality in veneers, we use two top cosmetic labs in New York and California. Our New York-based lab provides superior, lifelike veneers made from ultra-strong and beautiful zirconia—one of the latest advances in dental materials—for a strong, masculine look. We use our California lab for top-quality porcelain veneers with a very beautiful and lifelike, more delicate look. 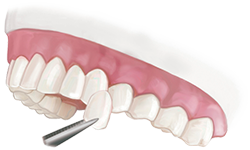 As a standard part of any veneers procedure, your teeth need to be prepared by removing a small layer of enamel so that the final result will look natural and will not appear bulky. Dr. Bartlett offers minimal-prep veneers that are ultra-thin and require very little tooth preparation. She will preserve as much of your natural tooth structure as possible while still allowing for the shape, contour and color of your teeth to be changed to achieve the smile you want. This minimal preparation is a gentle, comfortable procedure. Dr. Bartlett will perform detailed planning and preparation of your veneers treatment and will take great care to ensure that your veneers will be beautiful, natural-looking and enhance your features. Dr. Bartlett will discuss your smile goals with you in detail, so that she has a clear understanding of the results you want to achieve. Dr. Bartlett uses digital images of your teeth to assist in the visual design of your veneers. We will take intraoral (inside your mouth) and extraoral (outside your mouth) photos of your teeth for a comprehensive smile evaluation. 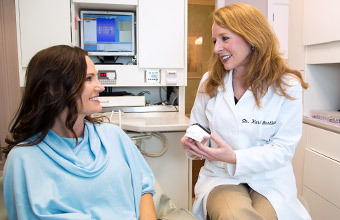 Dr. Bartlett will make cast models of your mouth, which she will use in her planning and preparation. For more extensive cases, she will additionally create a wax-up, a wax model of what your final veneers will look like. On the day of your veneers preparation appointment, we will block off the morning for you so that you will receive Dr. Bartlett’s undivided attention. Dr. Bartlett will usually gently administer anesthesia to ensure no sensitivity during your procedure. She will prepare your teeth by slightly sanding the front surfaces to make room for your veneers. She uses high-magnification optical instruments to make sure that this is done with utmost precision. This is a very gentle procedure, and Dr. Bartlett will take care to preserve as much of your natural tooth structure as possible. After your teeth have been prepared, we will take detailed impressions of them using special impression material. Your impressions will be sent to an excellent lab that we have a longstanding relationship with, where your final veneers will be crafted. Dr. Bartlett will make sure your veneers are beautiful and natural-looking. You will be fitted with high-quality temporary veneers that have a similar look to your final veneers. The temporaries will protect your prepared teeth and preserve your appearance while your final veneers are being created. When we receive your final veneers back from the lab, Dr. Bartlett will remove your temporaries and place your permanent veneers. She will take special care to ensure that your final veneers have a precise fit and line up seamlessly with your gumline. This will create a natural look and also ensures that there will be no gaps to allow bacteria to accumulate in the future. 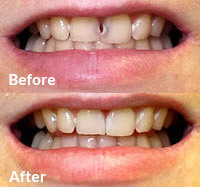 She will make any final adjustments so that your veneers are fully to your satisfaction. She received 8 porcelain veneers on the upper arch. This patient received 3 veneers and 5 porcelain crowns on the upper arch. 28 teeth, porcelain veneers and onlays on the upper and lower arch. Dental bonding is an alternative to veneers whereby the doctor uses a tooth-colored artificial resin for minor touch-ups such as fixing a small chip or discoloration in your tooth. Dental bonding can also be used to close small spaces between teeth, such as minor gaps that sometimes remain after orthodontic treatment. Dental bonding is an economical, quick procedure but it is not as durable as veneers and is also less stain-resistant. Learn more about dental bonding here. 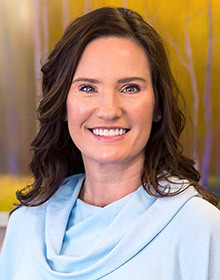 Dr. Bartlett can examine you and let you know what treatment option she recommends for you. You can come in for a Complimentary Cosmetic Consultation with Dr. Bartlett and find out how you can get the smile you’ve always wanted. Dr. Bartlett will discuss your smile goals, go over treatment options and answer any questions you may have.